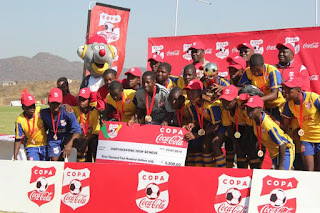 Chidyamakono High School is the first ever team in the history of COPA Coca-Cola tournament to win the trophy four times in a row after they dismissed Magwegwe by a goal to nil in the U17 Girls finals played at Pelandaba Stadium on Sunday. Rujeko also put up a spirited performance in the U16 Boys' category to win the coveted trophy after dismissing Chinhoyi by four goals to one in penalty shootout. The two teams had settled for a nil-all draw in regulation time. Chidyamakono, however, stole the limelight after scooping the trophy for the fourth time in a row. Neria Mashede sealed the victory for the Chivi-based side after Magwegwe goalkeeper failed to clear a seemingly harmless shot in the dying minutes of second half. For the grand prize, Chidyamakono received $3 200, kit, cooler box and two balls. An elated Chidyamakono coach Yeukai Chiruvu hailed her girls for a job well done. "This is a remarkable feat; I am really excited to win this for the fourth time in a row. I think experience counted most for us and the girls played according to instructions," said Chiruvu. "Our focus now is on the next tournament. We will start preparations this year and most of the players in the time will still be eligible to play in the tournament next year," she added. Six players from Chidyamakono were selected into the national dream team and these are Mashede, Define Ndambakuwa, Nyaradzo Chifamba, Ruramai Cheteni, Abigail Denge and Omopariola Havadi. For individual awards, Chifamba was voted Best Goalkeeper of the tournament, Define the Best Defender and Neria the top goal scorer, while Chiruvu won the Best Coach of the tournament award. National Association for Secondary Heads (NASH) president Johnson Madhuku said he was impressed with the level of competition at this year's edition of the tournament. "You would agree with me that the winners use the right age group and the players were a marvel to watch. I was impressed with the level of competition and skills displayed by the players. On behalf of NASH I want to thank the sponsors for supporting grassroots football," said Madhuku. Chivi district NASH chairperson Austin Hakunavanhu could not hide his joy after Chidyamakono won the trophy for the fourth time in a row. "Chidyamakono has made us proud as Chivi district; they have set new record by becoming the first ever team to win this trophy for four consecutive years. I'm very sure it will take decades to have another team that will break this record. I want to thank Chidyamakono management, technical team and players for a job well done," said Hakunavanhu. Meanwhile, Dewure who were the defending champions were eliminated in the semi-finals by three goals to one in penalty shootout by Chinhoyi after a nil-all draw in regulation time. Pamushana also failed to live to the expectation after they were booted out of the tournament in the group stages after they drew nil-all with Guinea Fowl and succumbed to a one-nil defeat to Rujeko in Group C. Dewure's Munyaradzi Matore was however the top goal scorer with three goals and was also voted the Best Midfielder of the tournament. Matore was also selected into the national dream team together with Lee Runodamoto, Edwards Machinya and Malfbaling Munashi.